Tara Speiser (bassoon ( 07-08 )) is a determined advocate for the future of music, she is an active interpreter of works by living composers, and has taught instrumental music in the Newhall Elementary School District since 1995. Early studies in foreign languages and linguistics lead to a uniquely vocal approach to playing and have fed a long fascination with the relationships between sound and language. Recent premiers include Gregory Moore's Maquettes, a spoken word collage of texts from 20th century artists and architects and real time solo bassoon (Highways Performance Space). 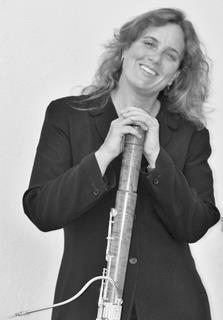 Tara is principal bassoonist with the Santa Clarita Symphony, a founding member of Bassoonistas Bassoon Quartet, and has performed with the Los Angeles Chamber Orchestra, New West Symphony, Los Angeles Master Chorale Orchestra, Mladi Chamber Ensemble, Santa Barabara Symphony, Riverside Philharmonic, Vinny Golia's Large Ensemble, and the CALARTS New Century Players. Formal studies include work with Julie Feves, Rufus Olivier, Thomas Tatman, Allan Vogel and Ray Pizzi. Tara received a Masters in bassoon performance from CalArts and a Bachelors from UC Santa Cruz.